Canada's award-winning experimental documentary project Highrise has partnered with the New York Times on a new interactive series. The National Film Board of Canada’s award-winning Highrise project is moving to New York for an interactive collaboration with the New York Times and its readers. The NFB announced a partnership this weekend with the New York Times opinion pages that will mine their massive photo archive dating back more than a century. The Times is calling on its readers from around the world to send images and stories about highrise living to their website. "I think the form and presentation and the vision of the project will excite people because it’s a beautiful experience that we’re creating," said Jason Spingarn-Koff, series producer and curator with the Times’ op-docs. "It’s going to be a rich, animated kind of playful storybook." The new partnership will produce four documentaries, including three films that aim to show how highrises have developed throughout history and where the future of vertical living is headed. The docs tackle issues such as "equity, segregation and social responsibility." "I just found the Highrise project so exciting and innovative, and they’re really at the forefront of making interactive documentaries," Spingarn-Koff said. "And I thought, to collaborate with them [the NFB] would be really wonderful." Highrise, started in 2009 and produced by NFB’s Gerry Flahive, shows the personal stories and living spaces of people in highrise buildings. The project set out to offer a look at what life is like inside these "vertical suburbs." It includes documentaries, an art installation and virtual environments that people can explore online. The Highrise project’s One Millionth Tower, a virtual landscape centred around a building on Kipling Avenue in Toronto, recently won the Canadian Screen Award for best original program produced for digital media, non-fiction. Highrise has also won the 2011 International Digital Emmy for non-fiction, the 2010 IDFA DocLab Award for digital storytelling and the BakaForum Cross-Media Prize for youth and schools. Highrise director Katerina Cizek said the partnership with the NY Times will shed light on a history many people have not had the chance to explore. The documentaries are to be created using photos that were not previously available online. "So much of the internet is about ‘everything is on the net,’" said Cizek. "And there’s a realization that, you know what? Everything isn’t on the internet." 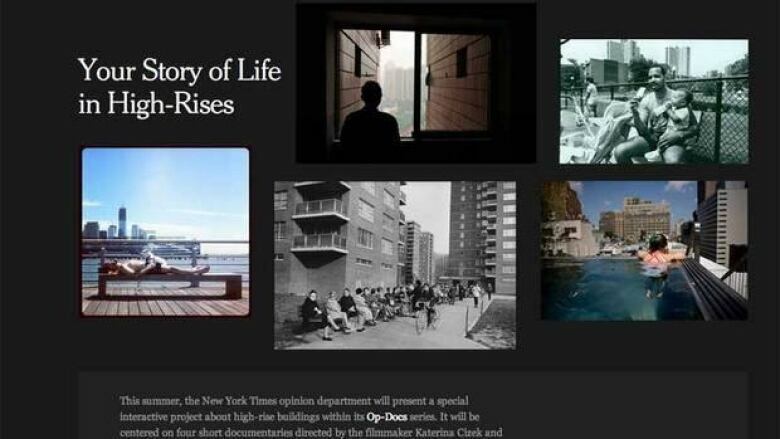 A Short History of the Highrise will debut this summer on NYTimes.com and NFB.ca/highrise.